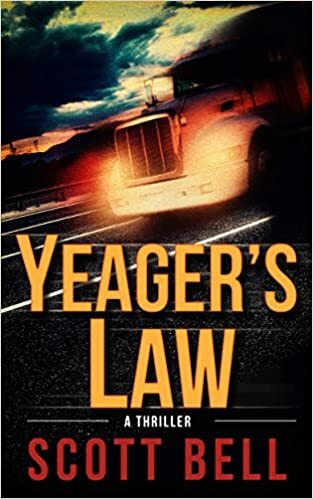 Cover Art: Hmmm… Yeager’s Peterbilt is red. The truck in the picture doesn’t look red to me. But, I must say, I like the sunset/sunrise backdrop and how the road is ‘angled’. It’s also nice that the cover shows action instead of looking posed. The cover is representative of the book since the book revolves so much around the truck. My Thoughts: Scott Bell is an author to watch; there is no doubt about it! There is rarely a dull moment in this novel, and Abel Yeager reminded me of Jack Reacher (Lee Child). Fans of Lee Child should definitely relish reading this book. With all the characters in the book, it can get a little confusing at times if you are not able to read the book in one setting or at least in consecutive days. Or, it’s not confusing and you can chalk it up to my faulty memory for getting the people mixed up once or twice before Yeager gets the books dropped off at Charlie’s. Thanks for the review! Very thorough, from top to bottom. You are most welcome! I really enjoyed reading the book!